[Jesus said] The one who enters through the gate is the shepherd of the sheep. The guard at the gate opens the gate for him, and the sheep listen to his voice. He calls his own sheep by name and leads them out. Whenever he has gathered all of his sheep, he goes before them and they follow him, because they know his voice They won’t follow a stranger but will run away because they don’t know the stranger’s voice.” Those who heard Jesus use this analogy didn’t understand what he was saying. When I was a nascent human being, we lived in a little clapboard house in small-town middle America. My favorite room was an addition to the back that opened the once-tiny family room onto a decent size den. The room was all windows and sliding glass doors, the light inviting me onto the cushy, comfy, autumn gold, orangey flames of fire shag carpet tiles. In one corner of the room, framed by two picture windows, a black stovepipe fireplace sat on an ash-mortared brick surround. I remember many winters playing and reading in that room as the snow fluttered past the roaring fire and my content little heart. That room was also where I first encountered The Bible. 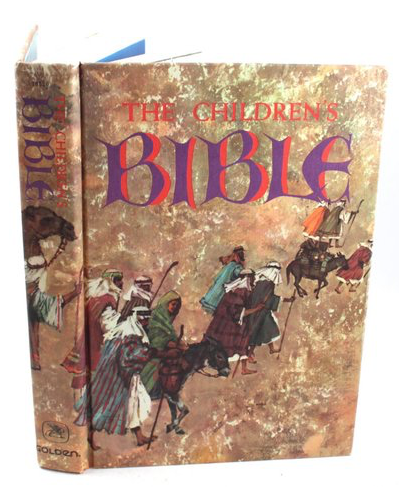 I remember snuggling into the shag carpeting in front of the fireplace and reading about Noah and Moses in the lushly illustrated “The Children’s Bible” many of you probably had as well. I don’t remember now exactly what I thought of those stories then, but I was reading them at the same time blockbusters like The Ten Commandments were first airing on television. The Greatest Story Ever Told was in theaters and Jesus Christ Superstar premiered on Broadway. These were the Marvel Blockbusters of my childhood. These larger-than-life biblical characters—Jewish people, my mother taught me—could do things like talk to God, part waters, and resurrect. I was captivated by the idea of ordinary people—slaves, even, moved by God to free others. In the Bible, God always moves people out of slavery, through the actions of humble, penitent people. Unfortunately, in the 1960s, my reality was different. While I was reading these amazing stories and seeing these epic movies, everything I heard on the radio and saw on the Facebook of its era—Television—was all about civil rights and Jim Crow and an end to “separate but equal;” all faces of outrage followed by extremely graphic, horrifying images of soldiers in Vietnam, followed by more faces of outrage. I saw these things a six-year-old doesn’t exactly understand but sees and hears, and in whatever imperfect way, remembers. For a kid like me, in a mixed-religion household at a time when religion was still vital in American life, what I was reading of God painfully contrasted what I saw in the world. So, I started to wonder: If God could part the waters to save people so long ago, if God could live and die as a human in order to truly comprehend and reveal an end to our suffering, then why didn’t God end our suffering already? Many of us ask this question still today. Why doesn’t God DO SOMETHING? The typical Christian response is that God did something already, in Jesus. Unfortunately, for many Christians, this has come to mean Jesus is the only way to God/Heaven/Salvation and until every person on the planet becomes Christian (whatever that means, since Christianity is comprised of, appropriately, a bountiful diversity of incarnations and beliefs), the world will continue to be a conflicted potentiality rather than a fulfilled and fulfilling paradise. Many, especially American Christians, read John 10 and see Jesus gathering the faithful into the fold, INTO the sheep pen, keeping everyone else out. They say Jesus welcomes the few, not the many. It’s a pretty un-Jesus like interpretation. All of God’s sheep. No exceptions. John 10 harkens back to God’s great I AM statements in The Ten Commandments. This makes sense because John writes Jesus as a Moses-like character leading not only Jews but also Gentiles, out of the pen, through the parted waters, and into a new and bountiful life of perfect God connection. No exceptions. Prayer: May we all grow to understand, appreciate, and respect, the beauty of the Christ found within every single one of us.